None of this would be possible without our strong local collaborations with community programs, nonprofits and housing authorities. These community leaders are doing some great work to help bridge the digital divide in their own backyards. For example, in Austin, together with the Housing Authority of the City of Austin (HACA) we connected three properties to Internet access at no cost. With that connection, HACA resident Christeen Weir graduated valedictorian of her high school and is now pursuing a biomedical engineering degree at UT-Austin. She credits the HACA and a Google Fiber connection with helping her achieve her dream to become the first person in her family to attend a 4-year college since she used it to help her research projects for school and fill out applications for scholarships. In Charlotte, we opened up our Fiber Space and worked with local partner DigiBridge to host a Daddy Daughter Code-In. In a twist on the Father Daughter dance, we brought in local dads and daughters together with the purpose of getting more girls involved in STEM. Thirty father-daughter pairs built Lego robots, made binary code necklaces, and learned about 3D printing. Due to the popularity of the event, Google Fiber hosted a follow-up Daddy Daughter Code-In, serving over 100 parents and children over the course of both events. Looking forward, our community impact work will continue to evolve as our business and technology does, and we’ll continue to focus on supporting high quality Internet and digital literacy programming for those who can benefit the most. With up to a gigabit connection, and local educational support, the possibilities go far beyond the bare minimum. Individuals will be able to get online to finish homework, find jobs, apply for college, and truly get connected. 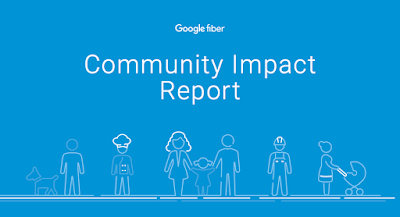 From the earliest days of Google Fiber through today, we’ve seen the transformational power of local partnerships and how access to super fast Internet - and all the tools that come with it - can drive progress in communities. From tech hubs and entrepreneurs, to low income families and seniors, those with access and training can leap over the digital divide. Today, we’re excited to share an in-depth look at findings from our work in the community through our new Community Impact Report. This report looks at how, through collaboration with local partners and nonprofits, some of the communities in need of more internet access have had the opportunity to thrive in an increasingly digital world. The full report, with national and local data can be found here.